Fearless adventurer Indi is once again hunting for treasures in this sequel to the fun physics puzzle! Explore the mysterious island and shoot ragdoll clones from your powerful cannon to collect all golden coins. Watch out for deadly traps in the jungle, use magical portals and help the bats collect ancient idols. Can you beat all levels and reach a high score? 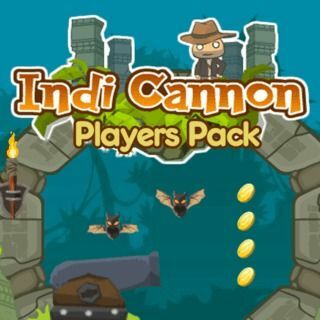 Indi Cannon - Players Pack - Find Indi Cannon - Players Pack in our vast HTML5 games catalogue. Only the best and newest HTML5 games for all audiences. Guaranteed success with Famobi.